One of the places I was most looking forward to visit during the last summer holidays was Rome. I mean, having watched movies like "Gladiator" and "Angels and Demons", of which the latter was one I watched again and again, it was like a dream come true to finally set foot in this beautiful city which boasts a two-and-a-half-thousand-year history. Even though we only had a day which was totally inadequate. But you see, there's honestly too much to see in this world and yet too little time (and money), so it's still better to have been there and seen that than not to have had the chance at all. Yes, I'm lucky, I know. We looked through the list of excursions that MSC Fantasia provided in Rome and in wanting to make the best of time, we decided to fork out the extra cash and embarked on an excursion called The Grand Tour of Rome, the Eternal City. It combined two of the most important aspects of Rome: Antiquity and Christianity. Considering that it took a 1.5-hour bus ride to get from the port of Civitavecchia to Rome itself, leaving us merely less than 5 hours for visiting, it was an achievement that we visited some of the most famous attractions here including The Colosseum, Piazza Navona, Trevi Fountain, the Pantheon, and of course the not to be missed Vatican City. The Colosseum, originally called the Flavian Amphitheatrum, is one of the most iconic symbols of Rome today. It is an elliptical amphitheatre situated in the centre of the city and is the largest ever built in the Roman Empire. With the ability to accommodate 50,000 spectators, the Colosseum was the scene of many deadly gladiatorial contests and wild animal fights. It was also used for public spectacles such as sea battles, animal hunts, executions, re-enactments of famous battles and dramas based on Classical mythology. 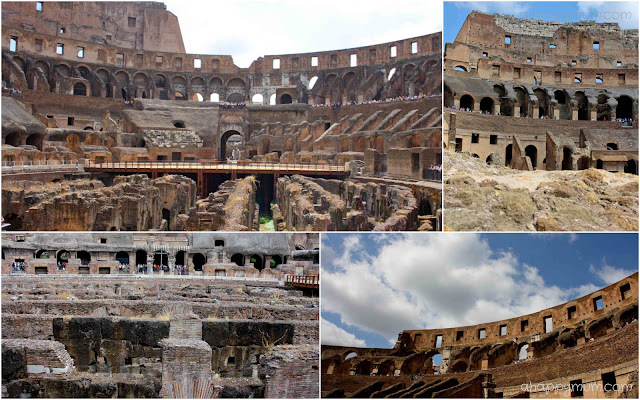 Interestingly, in the New 7 Wonders of the World initiative that sought to select wonders of the world from over 200 monuments and received over 100 million votes, the Colosseum was elected in 2007 as one of the new seven wonders and it was the sole representative from Europe. 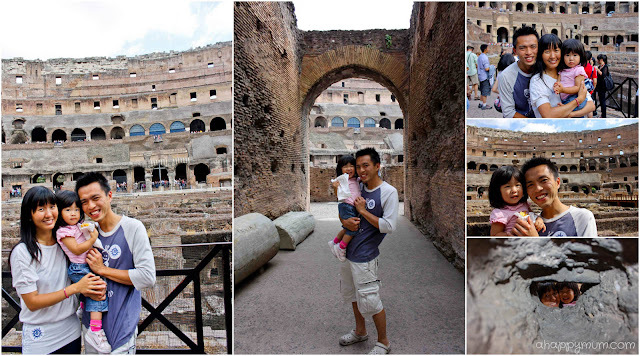 We were indeed thankful to have the chance to enter the Colosseum and admire the ruined but nonetheless impressive sight of this monumental structure. Well, that's one of the 7 wonders checked off the list for now. Standing at 26 metres high and 20 metres wide, the Trevi Fountain is the largest Baroque fountain in the city and one of the most beautiful fountains in the world. This impressive monument dominates the small Trevi square located in the Quirinale district. The central figure of the fountain is Neptune, God of the Sea. He is riding a chariot in the shape of a shell, pulled by two sea horses. Each sea horse is guided by a Triton. One of the horses is calm while the other one is restless, symbolize the fluctuating moods of the sea. Legend has it that if visitors throw a coin into the Trevi Fountain, they are destined to return to Rome. You have to do it the proper way though: 1) You should have your back to the fountain 2) Hold the coin in your right hand and 3) Toss it over your left shoulder. Some myths also say that throwing two coins will lead to a new romance and three coins will ensure either a marriage or a divorce. Well, I'm hoping we don't need any of these two ever but to come back to the Eternal City, why not try my luck with one coin? 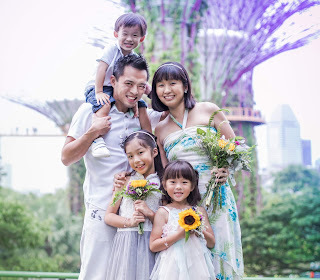 Angel found a new friend on the trip and just as how we love and think that the ang moh babies are so cute, they all seem to be in love with her too! It's always nice to chat with people from all over the world, so we are teaching our girl to always greet people with big smiles, hugs and a friendly 'Hello'! 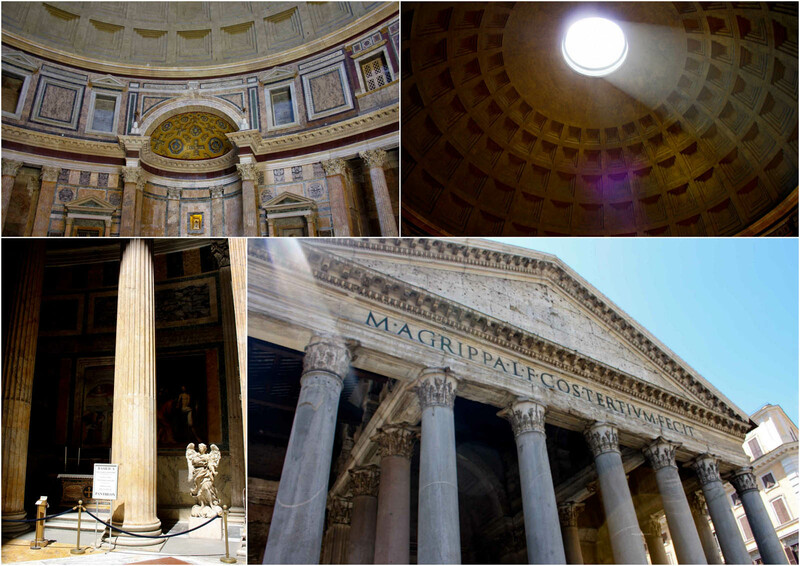 The Pantheon is a circular building which was commissioned as a temple to all the gods of Ancient Rome. Almost two thousand years after it was built, its dome is still the world's largest unreinforced concrete dome. At the top of the dome is a large opening, called the oculus, which remains as its source of light. With its thick brick walls and large marble columns, the Pantheon makes an deep impression on visitors. It is one of the best preserved of all Roman buildings and since the 7th century, the Pantheon has been used as a Roman Catholic church. The Pantheon borders the Piazza della Rotonda, a rectangular square with a central fountain, Fontana del Pantheon, surmounted by a Egyptian obelisk. Piazza Navona is one of the most famous and arguably most beautiful of Rome's many squares. The main attraction of the Piazza Navona are its three glorious fountains. The central and largest fountain is the Fontana dei Quattro Fiumi (fountain of the four rivers) -which features four figures at the base of a rock supporting an obelisk, each representing a river from a different continent - the Nile, Ganges, Danube and Rio della Plata. Piazza Navona is also one of Rome's liveliest squares and is always bustling with visitors in its many outdoor cafes, shops, restaurants and night clubs in the neighborhood. For lunch, we dined at SicoMoro restaurant which is located at just a 2 minutes walk from the Vatican. Thank goodness we didn't have to queue up if not it would have probably taken hours! In addition, we were treated to a delicious 4-course lunch along with red wine, not bad for a lunch on an excursion! Not to mention that our girl was so exhausted that she slept throughout and gave us a rare opportunity to dine in peace. Finally, we were heading to the Vatican City! As the world's smallest country, Vatican City occupies a mere 0.44km² (Our little red dot, Singapore, is more than 1600 times bigger!). Yet, it serves as the spiritual center for millions of practicing Roman Catholics worldwide. Interestingly, today we were in Vatican, the world's smallest country. The next day, we were headed for Monaco (read our adventures here), the world's second smallest country. Home to just over 800 residents, the Vatican City, or often called "The Holy See", is not just the smallest independent state by area, but by population size as well. That said, you have probably seen and can imagine how thousands of people gather in St. Peter's Square to hear blessings from the Pope or to participate in religious events. Inside the square, which is actually more of a circle, visitors are surrounded by two huge colonnades, with 284 columns arranged in 4 rows, atop which stands 140 saints. In the center of the square stands a prominent 25.5 meters tall Egyptian obelisk made of red granite supported on bronze lions. Matching magnificent fountains are situated on either side of the obelisk. St. Peter's Basilica, the crowning glory of Vatican City, is the most important church in the world. Having the largest interior of any Christian church in the world, it has been described as "holding a unique position in the Christian world" and as "the greatest of all churches of Christendom". The basilica's dome is the world's largest measuring 42 meters in diameter and reaching 138 meters tall. In Roman Catholic tradition, the basilica is the burial site of its namesake Saint Peter, who was one of the twelve apostles. 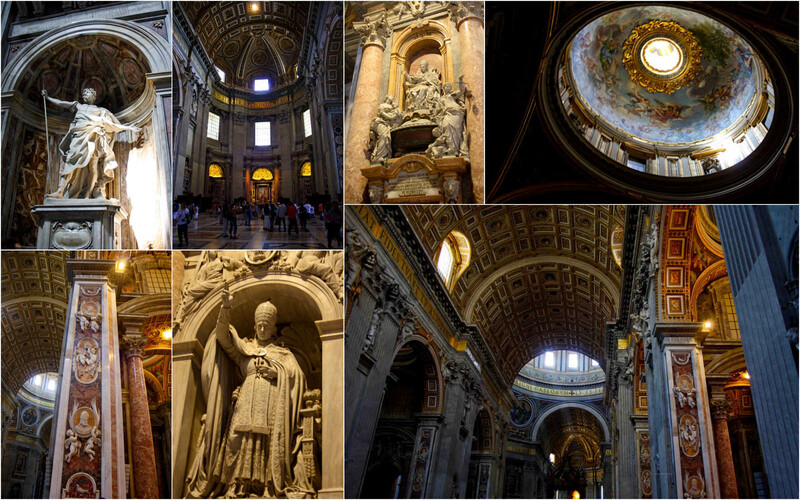 Tradition and some historical evidence points that Saint Peter's tomb is directly below the altar of the basilica. The opulent and beautiful interior of St. Peter's Basilica can be visited daily for free although a strict dress code is enforced. Many of our fellow tour mates were in for a disappointment when they were denied entry due to their above knee skirts/shorts or sleeveless shirts. Phew. Thankful we chose to cover up more that day, otherwise it would have been a real pity and regret. The interior, which includes 45 altars, is decorated by many famous artists. Some of the most important works in the church are the Pietà by Michelangelo, the papal altar by Bernini, the Throne of St. Peter also by Bernini, and the Monument to the Stuarts by Canova. Visitors who are not art aficionados, like us, will still be undoubtedly blown away by the impressive altars and monuments in the basilica. In fact, we stayed for way too long and almost missed our bus back to the port! On our way out, we saw some of the famous Swiss guards. They have been the guards of the Vatican and the pope in particular. All entrants to the army must be Swiss, catholic and they must take the oath of loyalty to the pope. All in all, Rome and the Vatican left us in awe and we were glad that we could at least spend a day in this awesome, historical and truly beautiful city. Have you wondered why Rome was called Rome, or rather Roma in Latin? Well, people say that this is also a city of love because the word for love in Latin is Amor, and when you spell it backwards, what do you get? I'm definitely loving the Eternal City and who knows, maybe one day when the hubby and I are all wrinkled and old, we might fly back here to spend Valentine's Day and feel the love in the air once more. You did all that in 5 hours?! Wow that must have been a really really tiring day for you! So jealous; I would love to do a big Europe trip some day! Beautiful pictures as always :) And Angel's hair seems to be getting more curly! Hi Adora, yes Europe is really a very beautiful place and there's too much to see. It was a rush day in Rome but we enjoyed every bit of it. =) Thanks for popping by! Angel's hair might become straight when you see her in sg, it seems to be losing its curls! 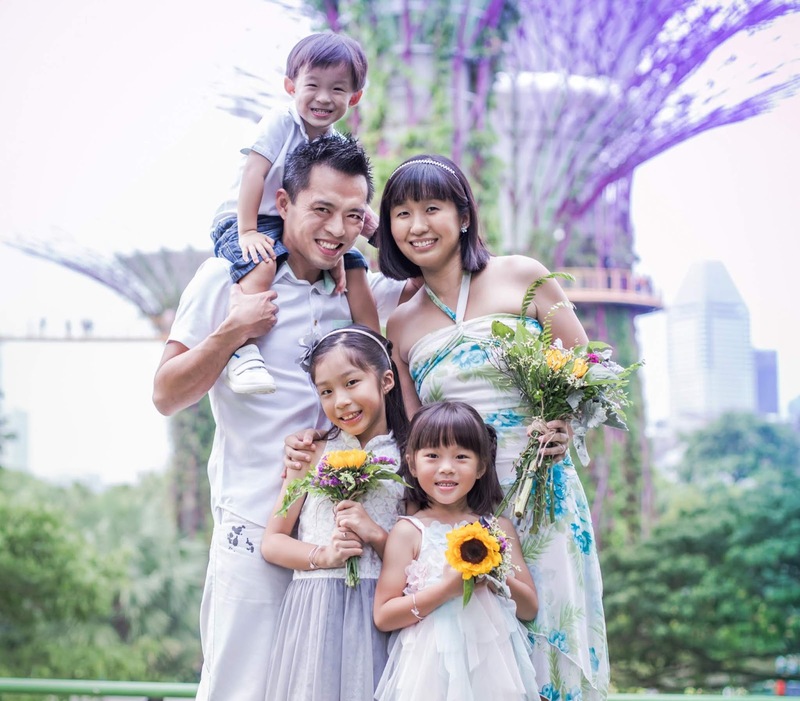 I'm your newest follower from Bloggy moms! Your photos are amazing!! What a great trip! And you have such a beautiful family! Thanks Dawn! Glad to make new friends and thanks for popping by! I'm your newest follower from Bloggy Moms. What an amazing trip and stunning photos! Hi Emily, thanks for the follow and I hope you'd like the pictures and posts. Cheers!